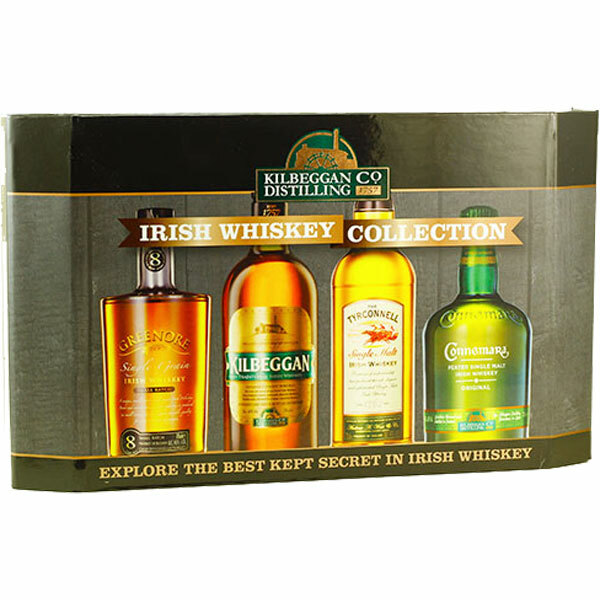 contains four miniatures showcasing Ireland’s Kilbeggan distillery’s mastery of a variety of different whiskey styles. 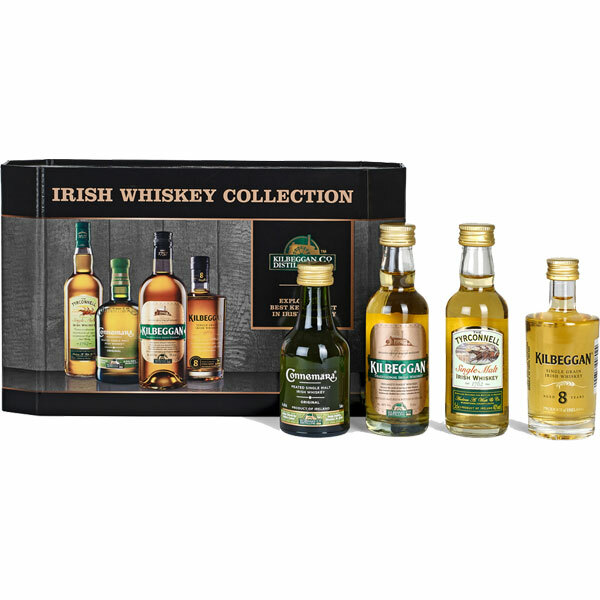 Pack contains Greenore 8yo (single grain); Kilbeggan (blend); Tyrconnell (single malt); and Connemara (peated single malt). 50ml Greenore 8 Year Old is an 8 year old single grain whiskey.This won Gold (Best in Class) three years running at the International Wine and Spirits Competition between 2008 and 2010. Greenore is distilled at the Kilbeggan distillery. 50ml Kilbeggan is the flagship blend from the Kilbeggan Distilling Company (previously called Cooley Distillery). Most of the whiskey that goes into the blend is matured in the town of Kilbeggan, however the spirit is distilled at Cooley in County Louth. Kilbeggan is a smooth and warming blend with some nice oak character and good depth of flavour. 50ml Tyrconnell is the name given to Kilbeggan Distilling Company’s unpeated single malt whiskey. This is the standard bottling which is aged for nearly 8 years but will typically have some older whiskey included in the vatting. The name Tyrconnell comes from a racehorse that famously won at odd of 100-1 and this brand was originally made at Watts distillery in Derry before disappearing for many decades. The Cooley Distillery (now Kilbeggan Distilling Company) resurected the brand and it has since gone on to become very popular as an inexpensive single malt. This is a vibrant and fresh tasting single malt with the exuberance of youthful apple and pear fruit combined with some creamy vanilla and gently spicy oak. 50ml Connemara is rare amongst Irish whiskey, its hook being the smokiness associated with the malts produced by our neighbours Scotland. It’s a style of whiskey that had died away in Ireland after the 19th century, when small distillers would probably have dried their malt with whatever fuel was available at the time. It’s said that when the Kilbeggan Distillery started up in the late 1980s, it had no plans to make a smoky whiskey, but at some stage peaty malt was bought and run through the stills with fantastic results. It’s a lovely malty whiskey with Kilbeggan’s signature honey and pear notes as well as a beautiful waft of smoke. Since it was released in the late 1990s, it has won over many fans of peated Scotch whiskies such as Laphroaig and Ardbeg. Yet Connemara still has a definite Irish character. Kilbeggan Distillery Irish Whiskey Miniatures is the perfect gift for the Kilbeggan Whiskey lover!